Sammy's Food Service & Deli opens its doors at 7 a.m. Breakfast is not the Gentilly restaurant's busy time. That distinction belongs to lunch, when a line running from the cash register to the door regularly features a member of every class and race in New Orleans. But in the early morning, when the angle of the sun casts a shadow on all but slivers of the window-lined restaurant's dining room, New Orleans appears prepared for battle. Literally. "I love our military guys," proclaims Gina Schloegel, Sammy's co-owner, referring to the camouflage-clad soldiers who, since Hurricane Katrina, have slipped in among the restaurant's regulars. "They're wonderful. I give them a 10 percent discount." On Wednesday morning, the only cars in front were labeled Military Police. Two soldiers -- they're prohibited by superiors from giving their names to reporters -- explained how their patrol of the 5th District begins at 6 a.m. "We come in here after 7, then again for lunch," said one. "They've got a nice little menu." His partner was finishing a plate of steak and eggs, which he orders "when I feel lucky." He otherwise favors the smoked sausage sandwich. Sammy is Sammy Schloegel, Gina's husband, a former butcher who takes pride in cutting his own steaks and pork chops, grinding beef for thick grilled hamburgers and hand-making sausage from recipes passed down from his late uncle John Shambra, the son of Sicilian immigrants. When Shambra passed away in the early 1990s, the Schloegels bought his butcher shop, Shambra's Food Service. They opened Sammy's in its place in 1993. "Homemade roast beef, Chisesi ham, red beans," Sammy said of his opening menu. "When we first started, we had rails (on the ceiling) with beef hanging from it. That's called hanging meat." In 15 years, Sammy's has grown into a beloved New Orleans neighborhood restaurant outside the media and guide-book gaze. It took two years to reopen the restaurant after it took on 7 feet of water when the levees breached following Hurricane Katrina. 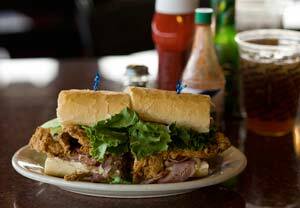 Lost in the rebuilding was the patina people normally associate with classic New Orleans po-boy/plate-lunch places. But beneath the modern tile is the great old-school lunch counter any food-loving Southerner would be thrilled to have down the street. The Schloegels didn't start serving food on glass plates until after the 2005 floods, but they're as reverent of their blue-collar fare as white-tablecloth chefs are of their prix fixe extravaganzas. 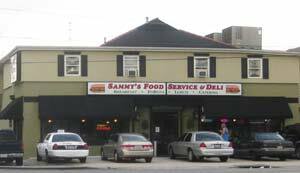 None of the meat served at Sammy's has ever been frozen, not even the big meaty chicken wings that come fried as a lunchtime favorite, or the smoked pig necks used to season everything from the fabulous white and red beans to the smothered cabbage, a Wednesday special. Everything but the pot-cooked dishes -- don't miss the crab-and-butter-rich seafood mirliton soup -- is cooked to order. In preparation for lunch earlier this week, Eddie White, an 8-year veteran of Sammy's kitchen, was coating thin, wide trout fillets in cornmeal. When they land on the plate, their edges are curled, the meat is flaky, their exterior still crackly crisp and hot-to-the-touch from the fryer. "If you want a pork chop with your white beans, we're going to cook it for you," Sammy explains. 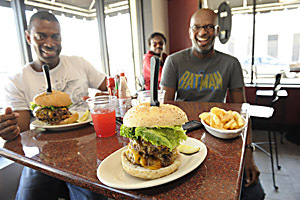 "We don't cook hamburgers and let them sit around. If you're rushed, call in advance and we'll give you the time frame. But I'm not going to change how I cook." "During the lunch rush, you've got doctors, lawyers in suits, cops, carpenters," says Sammy, who extends the military discount to police, firefighters and postal workers. "Kermit Ruffins was in here yesterday. (Gina: "He got two 20-ounce pork chops for breakfast.")  Chef Austin (Leslie, who died in September 2005 in Atlanta where he evacuated after Katrina) was always in here. He would joke that his wife would make him come." The crowd was typically thick on Monday when I tried Sammy's homemade hot sausage alongside my porky red beans. Seating was limited, so the stranger who grabbed a chair at my table was witness to my gasps of pleasure in response to the lean, deep-seasoned, griddle-sizzled patties. 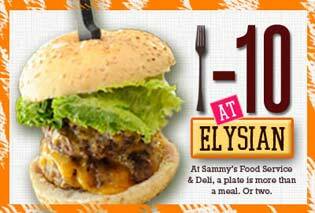 The stranger said he'd been eating at Sammy's for 11 years. I told him I was approaching the first anniversary of my first visit and had yet to have a bad meal. "Won't happen," he responded. "Not here."